Planning a rainbow themed unit? Want a colourful journal page to encourage writing and drawing? Learning about similes? This is the one for you! 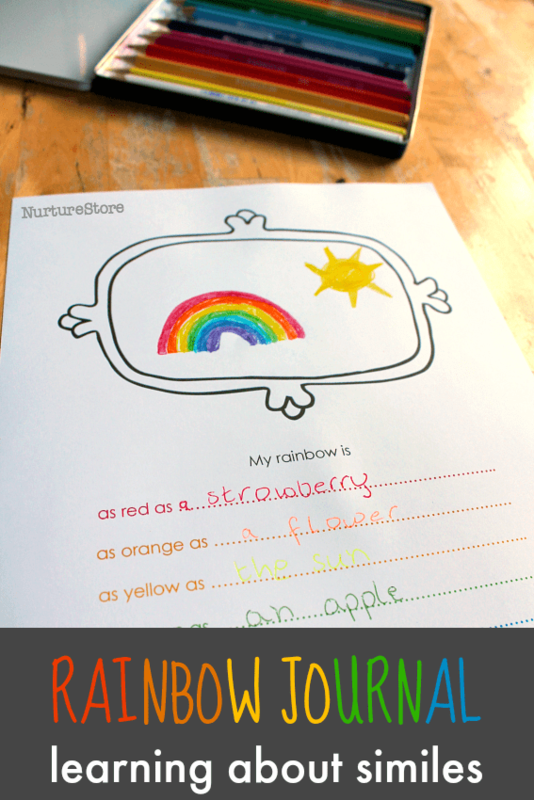 Use this free rainbow journal page for some colour-inspired writing, or for a lesson about similes. :: talk about the seven colours of a rainbow: red, orange, yellow, green, blue, indigo and violet. Which colour is your favourite? :: introduce the idea of similes. A simile is a way of describing something by comparing it to something else. An example is ‘as quiet as a mouse’, or ‘as strong as a lion’. We use similes to make our description more vivid or dramatic. :: what similes could you use to describe the beautiful colours of a rainbow? Can you think of something that is as red as the first arc of a rainbow? ‘As red as a…….’? :: fill in your sheet inventing similes for each colour. Be creative! There’s no one right answer – when you think of a colour in your mind, what do you see?